2008 was a mentally challenging, tough year for me. So many times during that year I felt alone in my situation, and most of my concerns kept me feeling isolated and on the fringe from those around me, those without the issues I was facing. When I first found out about blogs four years ago, I stayed up weeks straight, skipping around, following those home from other blogs, based on a certain kindness or gentleness I felt they had to their words. I've always been drawn to the ones who respond to others with tenderness and empathy. In my initial posts last week, I traced back how I came across the blogs I followed for the two years before I began my own site. 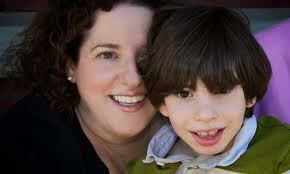 I met a wonderful lover of life blogger, Ellen Seidman, of Love That Max, through a Top Mommy Blogs voting contest. These lists compiled of bloggers to vote for is a great way to find blogs outside of the ones you read; like the Top Mommy voting with Babble and Circle of Moms -- you can find them grouped according to your likes and click in and out or stay and stay. I found Ellen through TheBump, where she was eventually awarded the Best Special Needs Blog Award. She is currently a finalist for Best Parenting Blog at Nickelodeon Parents Connect. With Ellen's blog, I had found another place where I could sit and rest and breathe deep. Ellen writes of her life with Max, her beautiful son, who had a stroke at birth. She doesn't paint a rosy picture, the colors she sometimes uses are the grey and the dark blue of the moods a parent feels when they know their child, and parenting a child with special needs, will not be like the world of the rest of your mommy friends. Her posts have a way of making you want to pack up your house and move half way across the country to be closer to her. She has that tone, of hugging you with the most basic emotion we crave: belonging. I emailed Ellen to let her know how her writing was keeping me going through a very dark winter. She emailed back and as sincere as her public writings were, her private communication went beyond any kindness I had come across during that time in my life. Her son, Max, had some crazy love for the color purple. Not an ordinary preference for the color purple, Max took it to the limit. Ellen would buy him purple shoes, purple cupcake frosting, purple sugar sprinkles. He loved it all. While reading her posts one morning, my kids and I had the greatest idea: we knew an author in town, Barb Joose, who wrote a book, "The Color Purple." We asked Barb Joose if she would sign a copy for Max, the purple loving boy. She generously did, and we wrapped the book -- in purple paper -- and mailed it off to Max. We expected nothing more than to make a little boy smile. What Ellen gave us back made our spirits soar. She made a post out of our gift. I wish Ellen could have seen the faces we had that morning when we clicked on to her site and saw our gift wrapped package, with her photos of Max each step of the way unwrapping his gift from us. I get a lump in my throat when I think of how she snapped photos of Max tearing into the paper and posting them up for all to see. This is the kind of woman Ellen is. I did finally get to meet her at BlogHer and I wanted to pick her up and swing her around; for her kindness and because she is so tiny and adorable in person. But I've learned that I can scare people who don't know me very well. But I know she saw my beaming face. I say tongue in cheek that my only regret in knowing Ellen is is that she encouraged me to start a blog, and then my visits to her site slipped in their pole position when I became too busy working on my own posts. But she did, she encouraged me to start a blog, and I did, and it changed my life. Ellen, I love you, and I thank you for the way you fostered the connections you did with me, and for so many others, at a time when we need someone like you so very much in our lives. Please click over and meet Ellen's son, Max. His fantastic smile lights up her site banner. He is an amazing little boy. Thanks for your blog, helps me know I'm not the only one who feels like this. Sometimes depression feels like its forever and I'm the only one. Usally I don't read blogs. I like the interactiveness(is that a word?) Is now, of twitter. Hope to see you there. Dave. I'm sure knowing that she influenced you the way she did will be very touching to her. That's awesome. Such a wonderful story and a dear friend you found. These stories make me remember what I love about blogging. p.s. in my comment, make the 'from I have learned' to 'for what I have learned'. I should learn to press 'preview' too. I love that I go away and come back and you are still you. Your youishness is refreshing. Oh, sweetness. Thank you for introducing me to this blogger--I am running off to check out her site now. Well, first I have some catching up to do over here. I've missed you more than you know. And what a beautiful gift you and your family gave Max. Your kindness truly knows no bounds. And for that I love you, Alexandra. i want to thank YOU for the way you reached out to me during this hard time. thank you GOD for blogs! Cooooool!!! Now I want to go visit the purple post. Well, wow. Today was one of those days when I was feeling a little overwhelmed by juggling my life, the kids and my blog (which some days feels like a third kid, although it does not whine at me). And then, I found this. I was so touched by your kind words back then AND for the the book. And I am so touched now, and also GRATEFUL that I encouraged you to blog and that you, in turn, have encouraged and inspired many other women. I will confess, one of my fave lines here is "She is so tiny!" Because I am also having a nothing-is-fitting-me-and-I-am-getting-big day!!! You're an amazing woman, one of my top favorite blogosphere peeps AND women I am glad to have met in real life. I've had a couple of bloggers like that, as well. Encouraging, empathetic, or uplifting and even just downright communicative. It's wonderful when that happens. I've very much enjoyed and looked forward to your posts about bloggers who helped you through 2008. This one in particular brought a tear to my eye. Not only reading about "super hero" Sam, his super mom but your family's thoughtfulness with the "purple" book. Special, special story! Your kindness in your private communications are as genuine and warm as your posts - just as you describe Ellen. I'm so glad you found her, as I found you. A great blog to check out...thank you! Thank you for sharing your inspiration with us, Alexandra. How wonderful it was for you to have found a friend like Ellen and at such a great timing too! From what you've written about her here, I got a glimpse of the incredibly positive, caring, and courageous woman she is. Wonderful, wonderful. Blogging at its best. xo. I love to learn how much blogging has impacted you. So many special people out there! i am an ellen groupie too, love love that max! I wish I would have thanked her sooner. I had no blog when I met her and she convinced me, and this is one of the BEST times I've had in my life. What a lovely tribute to a lovely person from a lovely person. I know...all the lovelies, but this post deserves them. This is just so, so sweet. What In The World and Are Those Caterpillars? Yeah. It Hurt A Little.